Spring is the perfect time to dig out all your denims: the girlfriends, the boyfriends, the bleached, the ripped, the frayed, the jacket, the shirt- it is time they see some sunlight. This is your only chance at wearing them before summer rolls in and it gets too hot to even touch them. This spring in particular, I'm seeing several newer ways designers are using denim. Their creativity is taking the denim trend places. 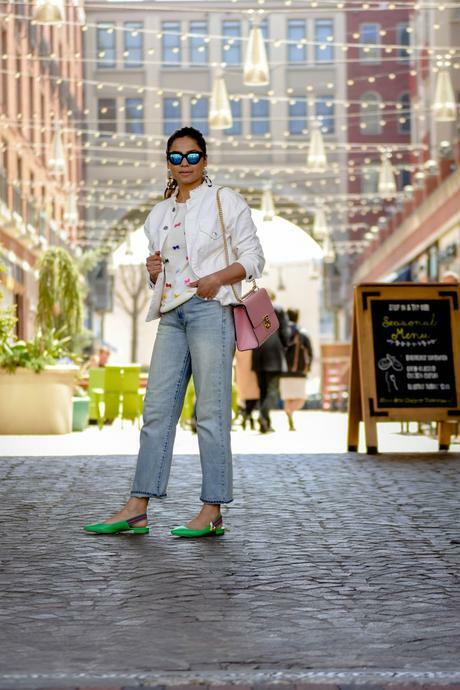 We are no longer betrothed to skinny or the bootcut- it is all about variety this spring and if you are a denim connoisseur, then you would definitely be interested in giving the following denim trends a spin. The skinny girlfriend jean : a fitted version of your boyfriend jean, the girlfriend jean has gotten a facelift this spring. It is a little more fitted, but relaxed enough to give that cool-girl-vibe. Embellishments, embroidery and even appliqués are becoming a major denim-sensation. All these details make your GF jeans everything but boring. The Colored denim: spring is all about color and by no means should your denim be deprived of this cheerfulness. While the classic dark blue jean is still going strong, colored denim is getting a fair play. Go for a pink, green or a red pair of jeans, just have some fun. Not only are the bottoms, your go-to denim jacket is getting a major color-therapy too. This denim jacket from Gap has been on my wishlist for a couple weeks now and as I am writing this post, my want for it has grown threefold, which means in the next few weeks you would spot me wearing it. The denim overall- call it a dungaree or a denim jumpsuit, this denim trend is a must-try. For all those ladies who are looking for an easy-peasy weekend outfit option, a denim overall might be the answer. Wear it with a fitted tee and flat mules for a more casual feel or dress it up with a sheer button front and some high heels. Personally, I feel this trend is not for me, blame it on my inverted triangle body shape. It just never seem to fit my body right. The denim footwear- this one has to be my personal favorite of all the denim trends for Spring 2018. What more could a shoe-a-holic ask for after all- another pair of shoes, right?? Mules, pumps, sandals and even sneakers, every shoe style under the sky is getting a denim makeover. I am stalking a few pairs of denim heels, of which this, this and this are high contenders. I can live in these denim shoes, loving them so so much. Which denim trend are you feeling this spring? ?